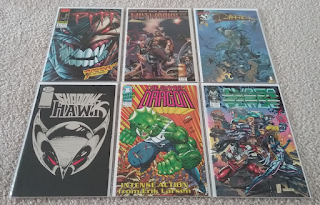 It's a new year now, so what better time to kick off the return of my comic hauls? If you're the kind of person that cares to read anything and everything I write, that is. Are you? None of these entries are in any particular order, and this isn't everything I have acquired since mid-July, it's just the stuff I know I bought since then that was readily available to take pictures of. Not that I need to go through and list everything. That would be excessive and this is already long enough as it is. You don't have to read this next part if you don't want to or if you already know what Marvel Legacy is. It will be relevant in a minute, though. So, to begin, Marvel Legacy. How do I explain this to people who don't know much about comics? Of course, if you're not into comics I don't know why you'd be reading this, but whatever. Anyway, we'll use Amazing Spider-Man as an example. Amazing Spider-Man launched in 1963 with its first issue. This series went on for many years until it ended in 1998 with issue #441. Almost immediately, Amazing Spider-Man relaunched with a new #1 in 1999. 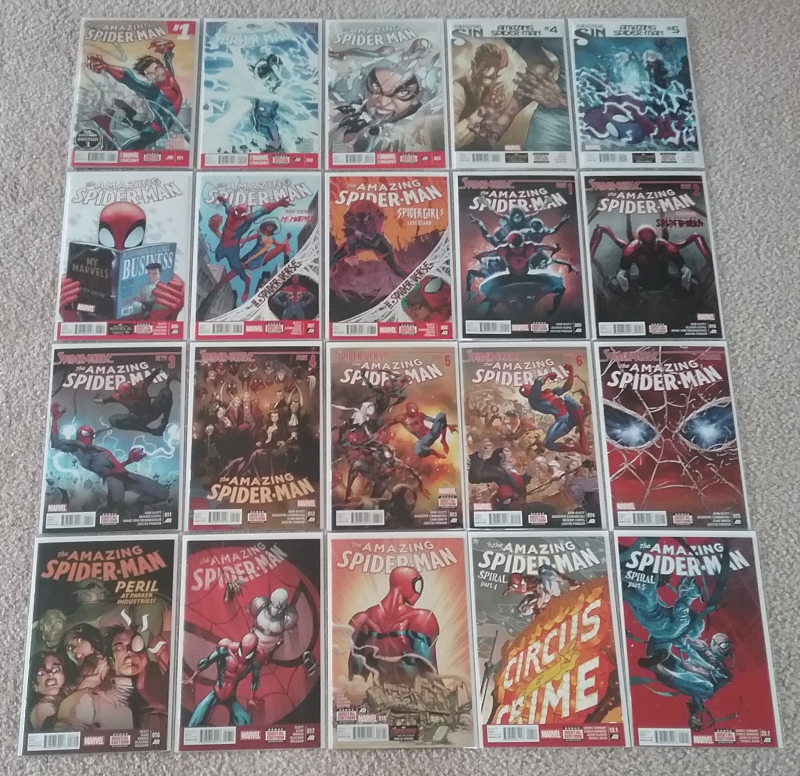 This series went on for a while until Marvel realized that had they not rebooted the series, they would be hitting a landmark issue #500, so when that issue was released, they reverted back to the old numbering and did so until issue #700 in 2013. This is the point I got out of reading it because I thought #700 was a good stopping point and I was not on board at all with what was happening in the book. 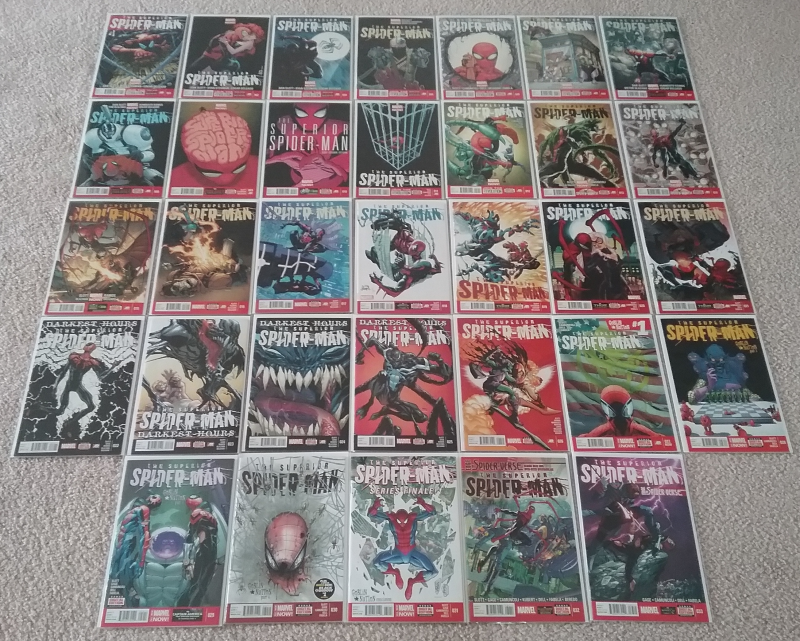 After issue #700, the series was again rebooted as Superior Spider-Man with a new issue #1. This went on for 33 issues until the story was resolved and when it was, you guessed it, it was rebooted yet again with a new issue #1. This series went on for a meager 20 issues until... well... reboot. With a new issue #1. Now, what Marvel Legacy is doing is acting like these series were never rebooted, and if you add up all the issue numbers together from every volume, that's the what the current Legacy number would be. Currently Amazing Spider-Man is on issue #793. So that's Marvel Legacy. So! To celebrate this, Marvel put out lenticular homage covers for some of their books. They're not that easy to get in my local comic shop because the shops apparently have to jump through all kinds of hoops to get them. In any case, two of them showed up at my local comic shop. 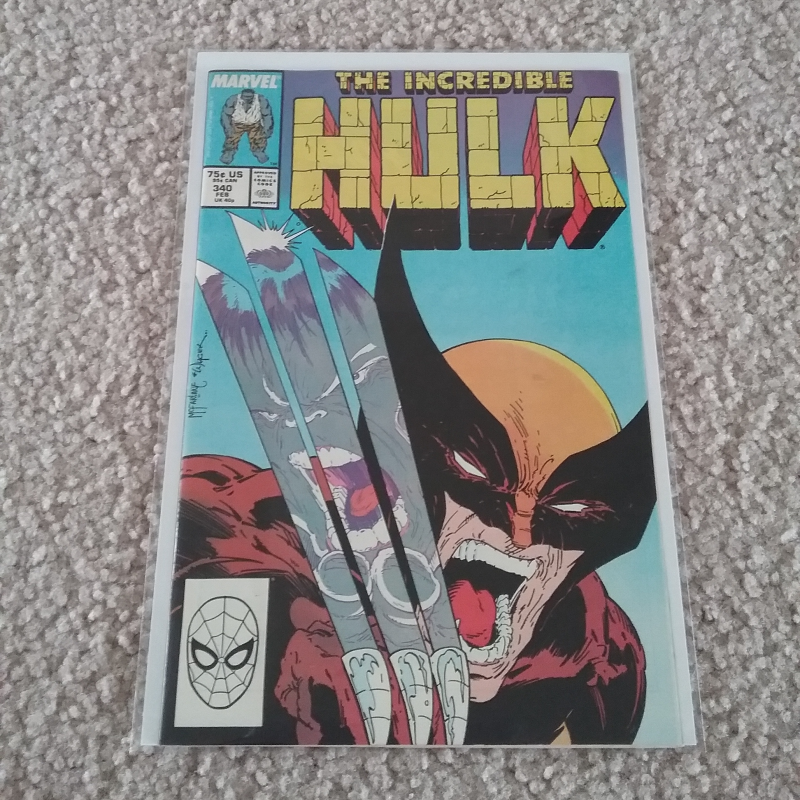 The first one I got was the first appearance of Cable homage. The second one was the first appearance of War Machine homage. The Spider-Gwen one on the right I bought off of Amazon. It's an homage to my favorite Spider-Man cover of all time, so I had to have it. 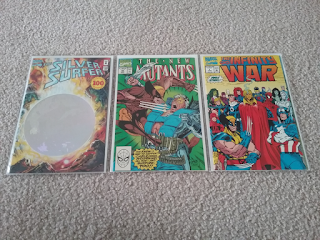 Before I move on from Marvel Legacy, when I learned about it I decided I should fill in the holes in my collection since I had stopped buying it at issue #700. 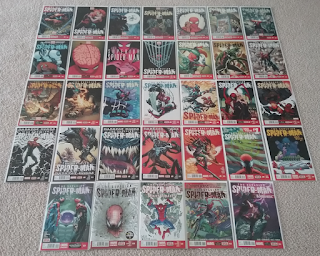 I bought every issue of Superior Spider-Man over the course of a few weeks from My Comic Shop. I have to admit, I was completely wrong about this book. I actually really enjoyed the story. None of the issues were expensive, either. I managed to put the entire set together relatively cheap. 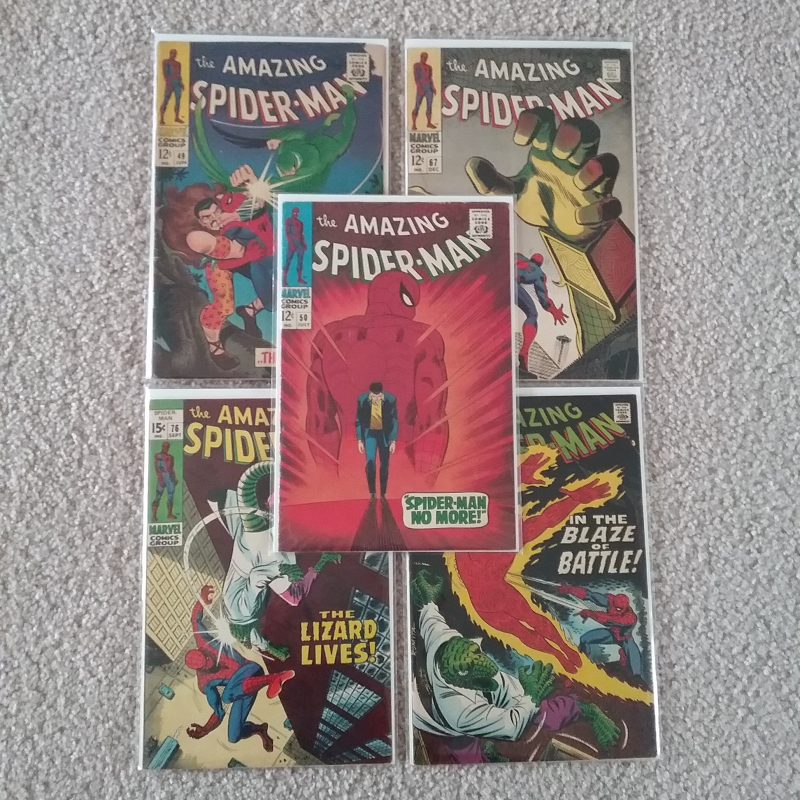 Of course then I had to buy every issue of Amazing Spider-Man from the volume that was released after Superior. This one had a money issue in it (#4 is the first appearance of Silk) but even that didn't cost too much. I finished reading all these the other night, and I really enjoyed this as well. The Spider-Verse stuff was fantastic. My only gripe with it is the way Black Cat is written now. I understand why after what happened in Superior Spider-Man, but still. I like Black Cat a lot and she seemed pretty ruthless. Last bit of Spider-Man stuff. 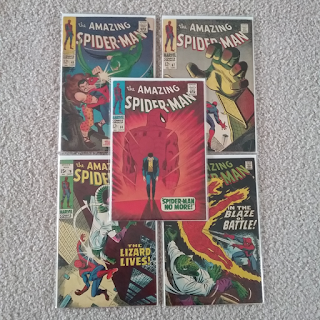 I picked up several old issues of Amazing at my local comic shop Campus Comics. The one in the center is the first appearance of Kingpin, and it wasn't cheap. Fortunately the owner Mike allowed me to make payments on all of them because there's no way I could swing them all at once. Let's just say that first Kingpin is far and away the most expensive comic book I've ever purchased. 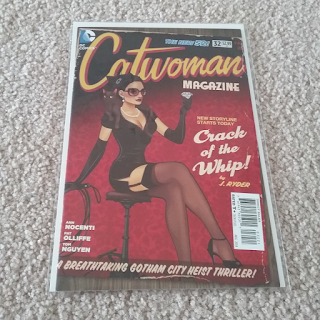 In my last comic haul article I showed an awesome Catwoman poster I picked up. 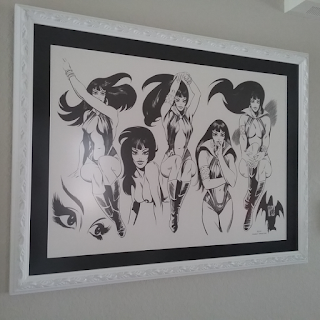 Then in my statuesque statues article I showed a beautiful statue I had bought based off of that same art. 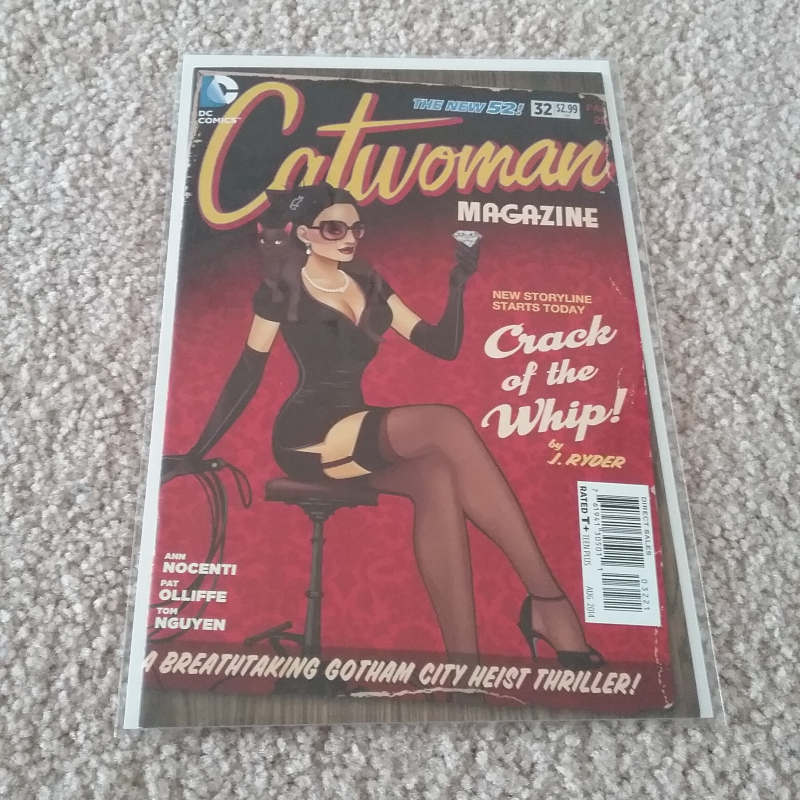 Then I thought I should pick up the actual comic the art comes from, so I found it online for super cheap and snapped it up. Speaking of posters, over the summer I spent a week in Indiana with my friend Jim. He took me to several great comic shops and at one of them I found this poster of Captain Marvel. 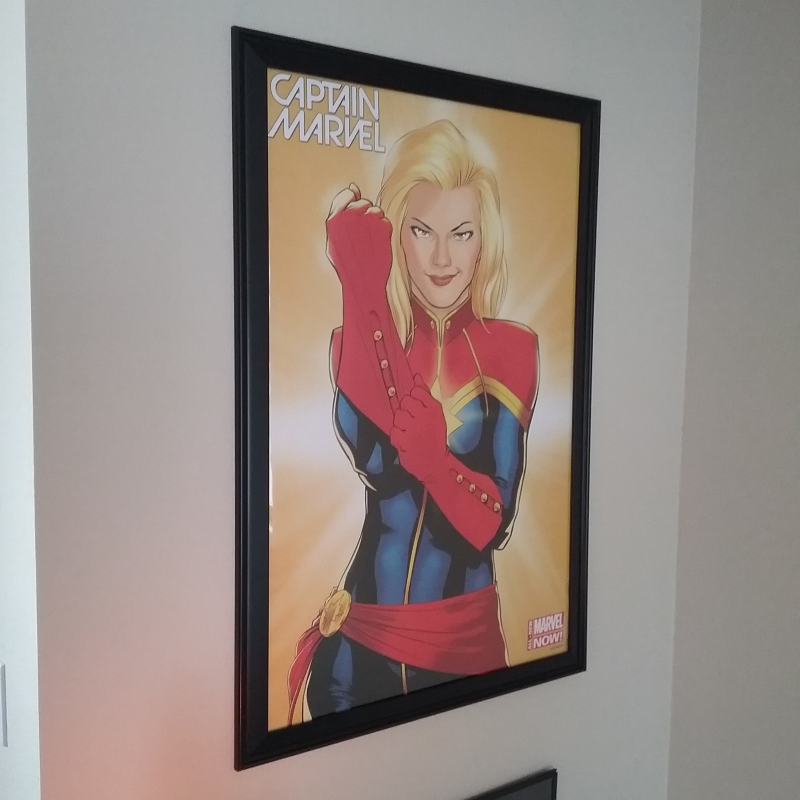 It's the art from the first issue of the 8th Captain Marvel series (at least it was until Marvel Legacy), which is a comic I originally purchased to put in a frame on the wall. I never got around to doing that, so a poster is even better. 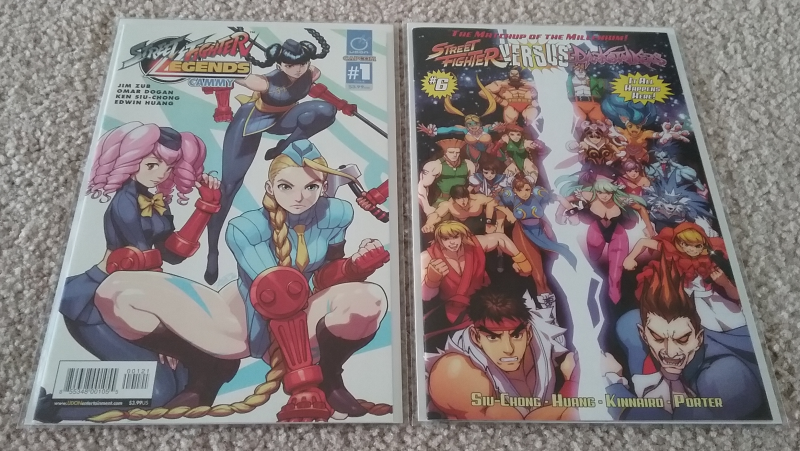 I bought these two comics with Rob Porter covers from Mile High Comics. I also bought a Spider-Gwen comic from them which I completely forgot about until I typed Mile High Comics just now. Anyway, I bought a few things from them as a test to see what they're all about since I'm a regular My Comic Shop customer. I was put off by their website as it looks like some unreputable site from the early days of the internet. They did have a few things My Comic Shop didn't (and never has as long as they've been on my wishlist) so I figured I'd give them a try. They clearly arrived, but I think I'll stick with My Comic Shop if at all possible. 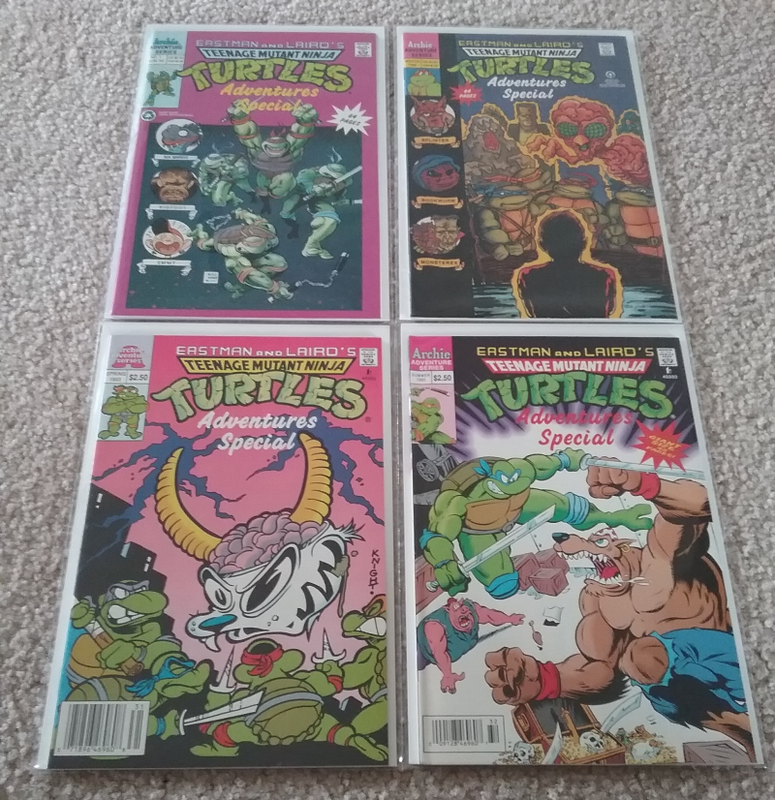 If you've been reading these, you might have seen that I've been trying to get every issue of the Archie Teenage Mutant Ninja Turtles comic. 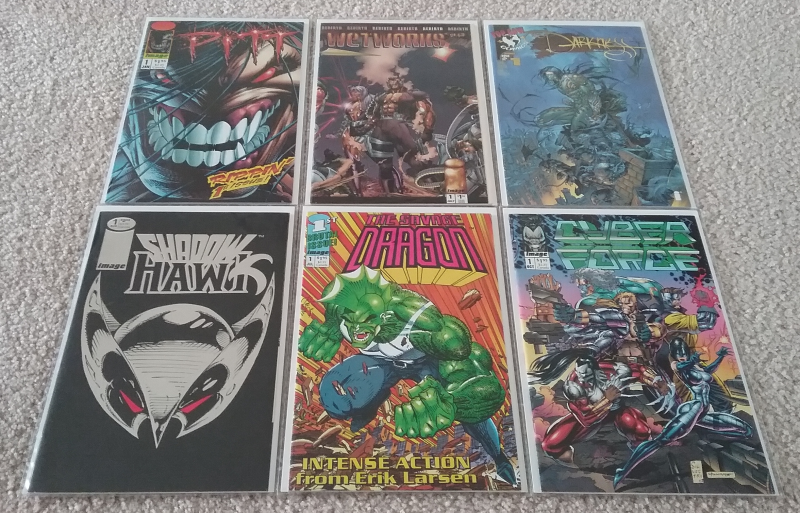 I have almost every issue of the main run, but there are also these specials (annuals?) that they put out. 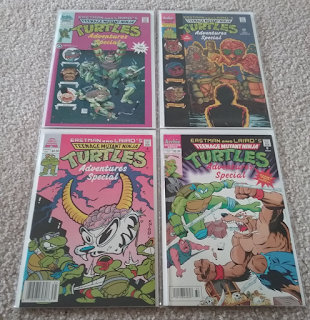 I think after buying these I'm only missing one issue. I am also trying to get every issue of the Marvel G.I. Joe comic. 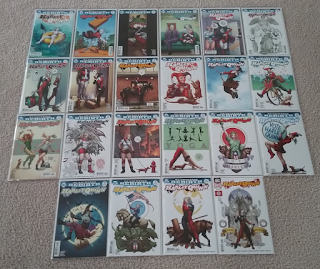 I only need four issues of that, but the ones I do need aren't very cheap. 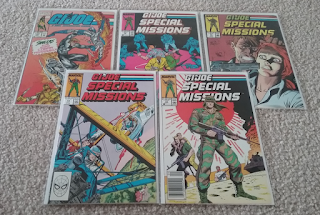 After buying these issues here, I now own every issue of G.I. 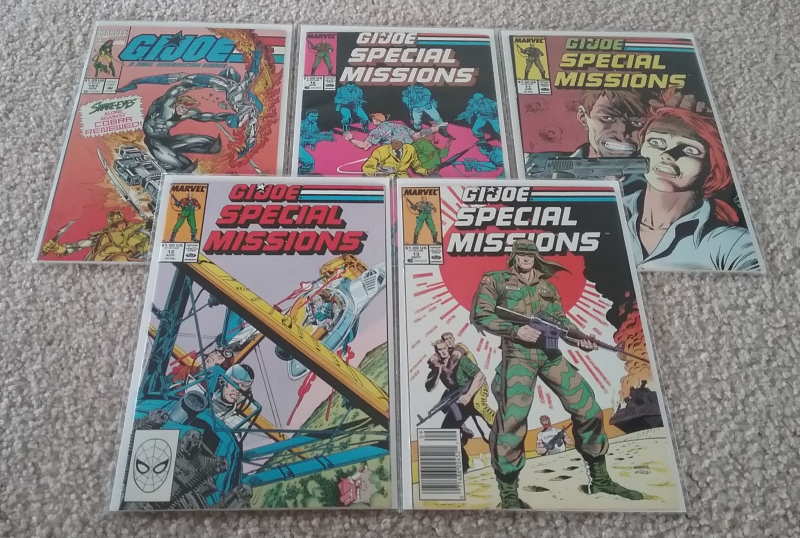 Joe Special Missions. I was never really a fan of that series, but whatever. 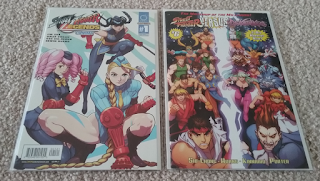 Here are three random issues I picked up at various times. 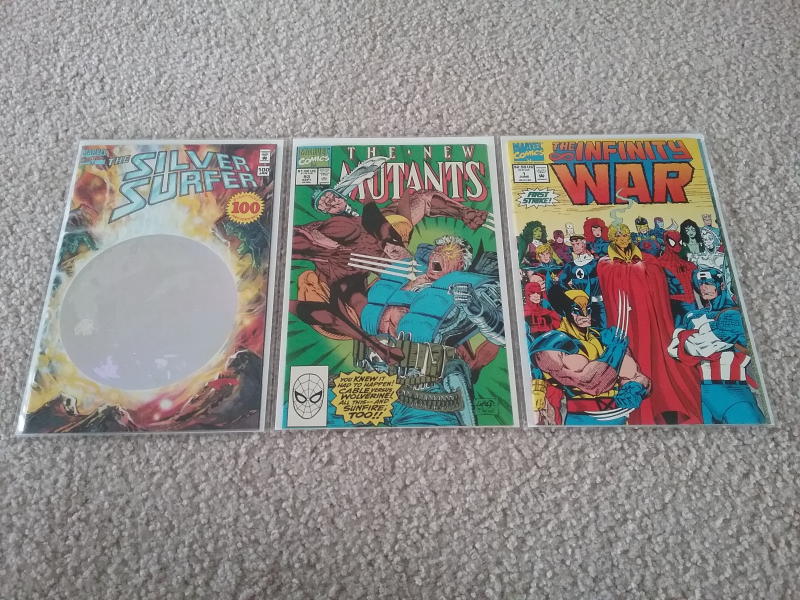 The first one is a hologram cover Silver Surfer comic. It had been on my wishlist for a long time, so I finally got tired of seeing it there and bought it. The New Mutants comic is one of the only ones I needed of the Rob Leifeld/Todd McFarlane cover set. Then Infinity War #1 is the first appearance of the Spider-Man doppelganger. There's really not much to say about these three, I'm afraid. But, speaking of Todd McFarlane, I finally bought this iconic Incredible Hulk comic. it was the only one I needed to complete the set, and I paid $50 for it. I remember when I went to Cape Con I saw a guy walking around with a comic collection he was trying to sell and this issue of Hulk was in it. I caught up with him after he had left a vendor and offered him $80 for it and he wouldn't take it. Looks like patience was rewarded. Since I'm talking about Todd McFarlane, it's hard to mention Todd without bringing up Image Comics. I saw a great documentary series on YouTube about the founding of Image Comics called The History of Image Comics (So Much Damage). Definitely give it a watch. In it they talk about the Image founders, so I decided I would try to get the first issues of comics by the Image founders that I didn't have. Then I went a step beyond that and bought the first issues of some other important Image books. It's a nice little collection to have, I think. What else was big back when Image Comics was coming into being? Wizard: The Comics Magazine, of course. 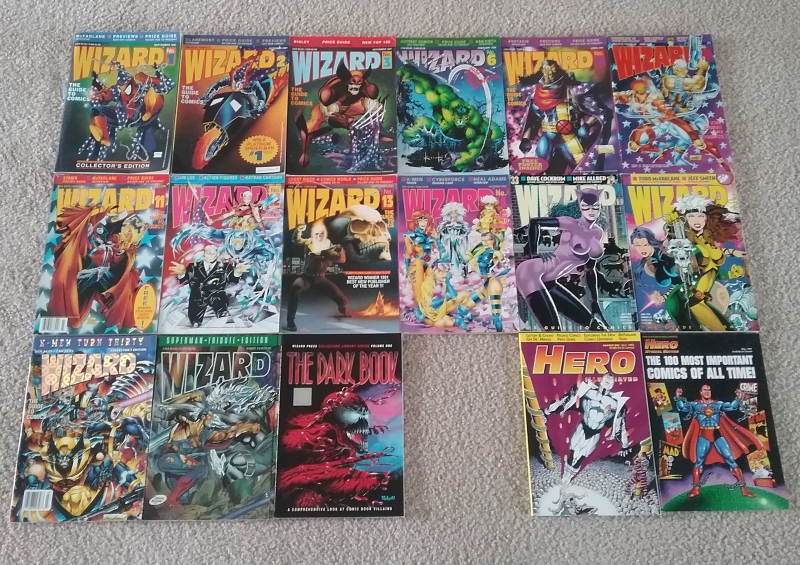 I foolishly threw away all of my issues of Wizard several years ago and I have since been trying to rebuild the collection. However, I'm not just buying the ones I used to have, I'm trying to buy everything. 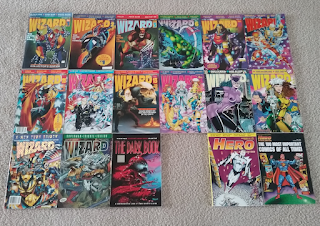 The earliest issue of Wizard I had before was #11. Hero Illustrated was another one I had, so I started buying that as well. For Christmas I gave gifts to my friends at my local comic shop. 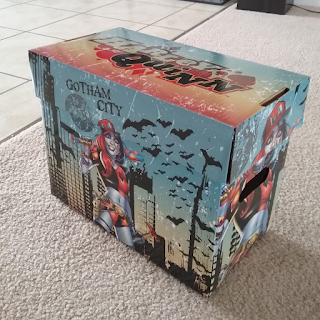 My friend Mike who owns the shop gave me this Harley Quinn short box! It's a really awesome piece and I keep my Harley books in it. It's actually the only short box I have with graphics on it. He typically doesn't receive them when he orders them, so I'm glad if any of them came it was this one. Also inside the Harley box was this Dynamic Forces copy of Harley Quinn #1 signed by Jae Lee! Definitely a cool gift and definitely something I was not expecting. So... Harley Quinn again. 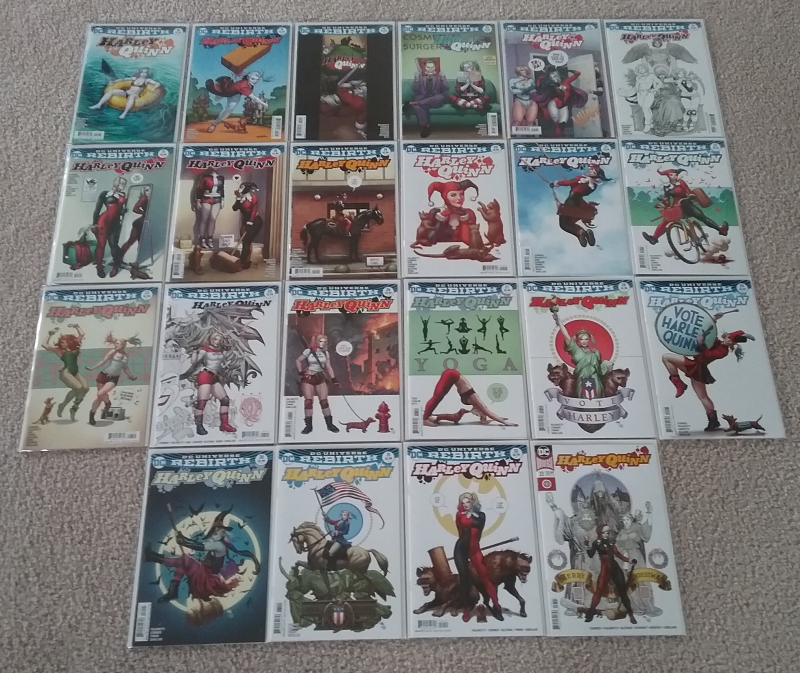 I've been buying the Frank Cho variant covers from the current Harley Series. I'm only missing a few of them at the moment. 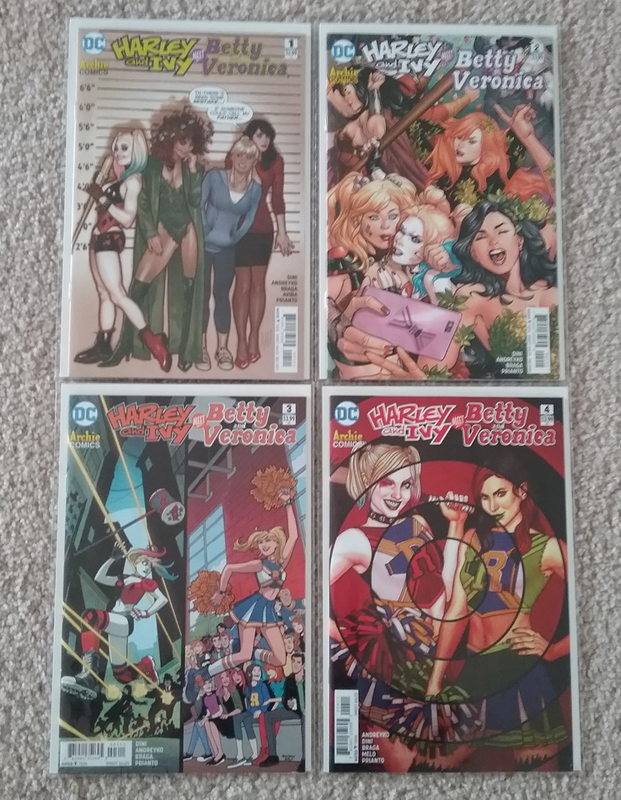 I really like the way Frank Cho draws, so these covers are a must for me. I also recently bought a bookcase to hold my various Harley Quinn things. I also put my Spider-Gwen collection on it. The bottom shelf are the books I own, which aren't many but still. 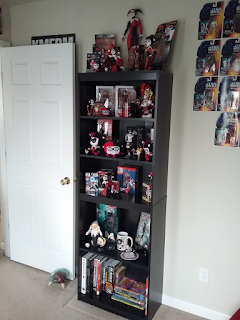 My Harley collection had outgrown the top of my game shelves in the living room, and I had the space in the second bedroom so I thought why not. 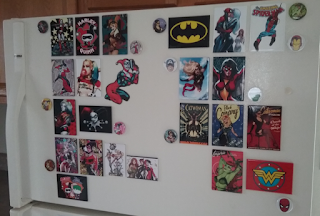 I have also bought more refrigerator magnets. I have a pretty decent collection of Harley Quinn magnets as well as a few others. ATA-BOY makes great magnets, and most of the ones I have are from that company. I'm still surprised I found a Ms. Marvel magnet. You don't see much Ms. Marvel merchandise. 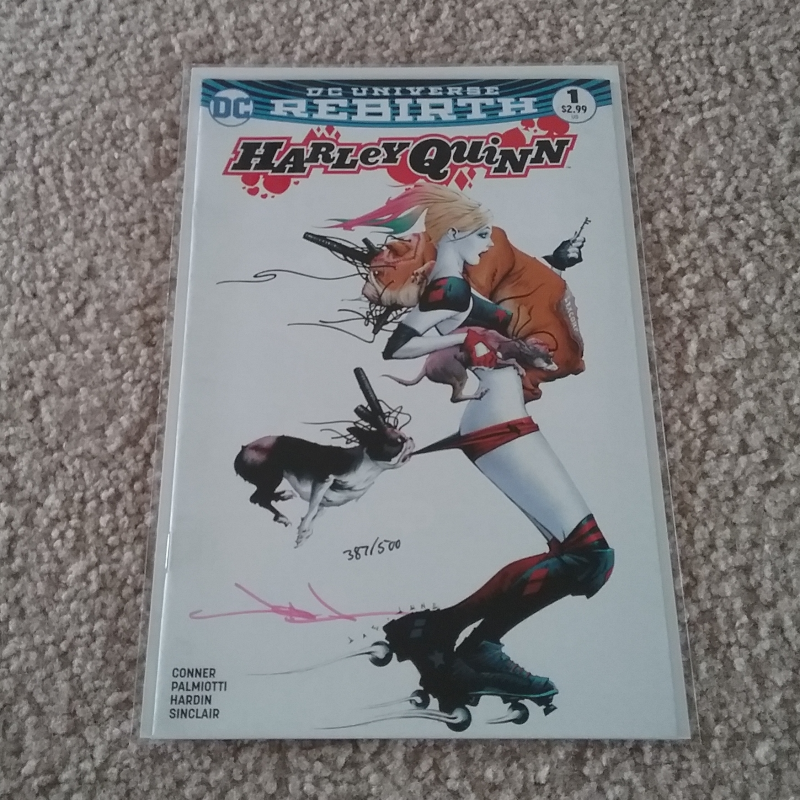 About done with Harley, I swear. 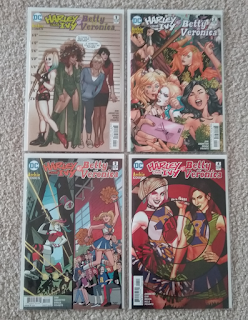 I've been buying this mini series called Harley & Ivy Meet Betty & Veronica. It's a cute book, but I don't have any attachment to Archie characters. I apparently had the shakes when I took this picture because every picture I took of them was blurry. Ordered this Power Girl bust statue on Amazon a few weeks ago. It's only a few inches high, but it's Power Girl so I had to have it! There's another bust statue that's about this size that I'll have to track down now. I would get every Power Girl statue since there aren't many of them, but I'd hit a wall pretty quickly when it came time to get the Sideshow premium format statue. I'd love to have it, but... I don't make that kind of money. 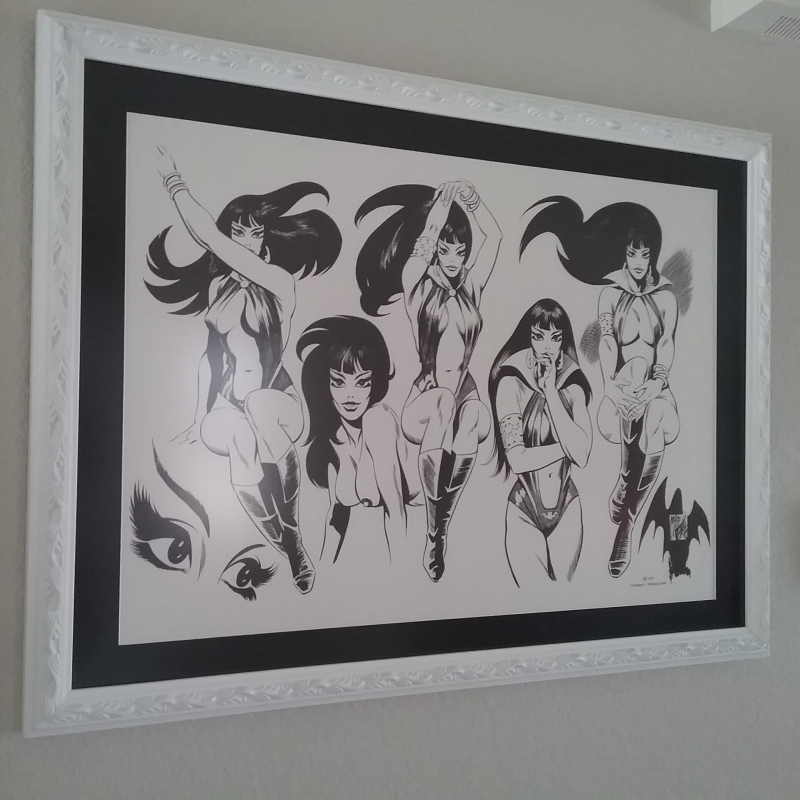 I kind of got on a Vampirella kick a while back and bought this framed artwork from my local comic shop. The previous owner of the shop had it and sold it to the store, and I ended up buying it. It has a copyright date of 1972 on it, but it can't be that old, can it? Maybe it's a reproduction? I don't know. I can't find anything about it online. I also got these Vampirella comic books the other day. The two black and white ones and the gold foil one in the top left are all limited to 500 copies each. The one in the top middle is a "satin edition." I don't know anything about it other than that. The Wetworks one I bought when I was buying up the aforementioned Image comics. 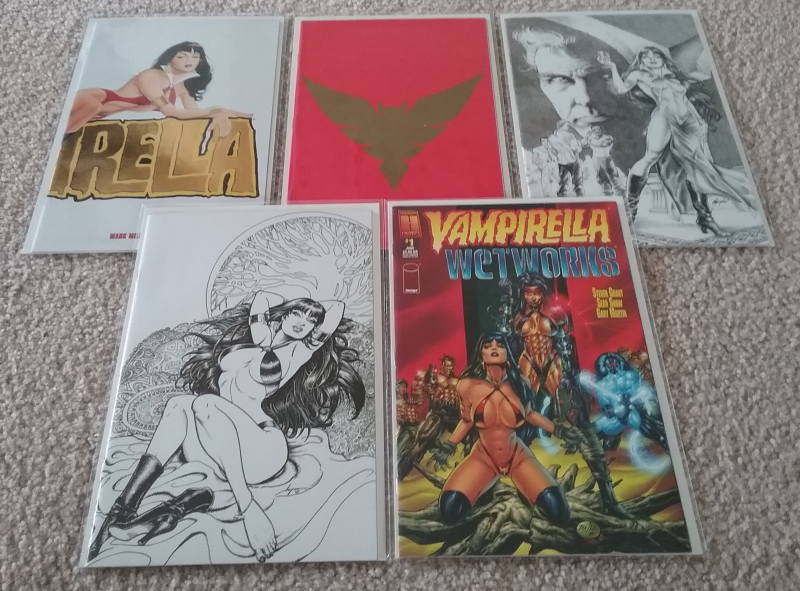 Then last, I made payments on this Vampirella statue at Campus Comics until I payed it off. I had my eye on it for a while, but I was always too afraid to ask how much it cost. The price wasn't unreasonable (clearly) and I brought her home right before Christmas. This is easily the biggest statue I own, and it might be the most expensive as well. In any case, I love her, and I'm glad she's part of my collection. And that will do for now. I know I have neglected doing these for a while now, but I hope to start them back up again. It all just depends on whether or not I buy anything that week. Comic convention season kicks off in mid April, so I wanted to get this up and going again before that time.